Keil Tree Experts - Maryland's most trusted tree removal service. Baltimore County, Maryland’s Tree Removal Experts! 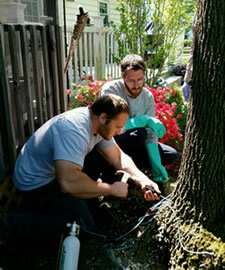 Give us a call today at 410-771-4896 for a FREE estimate on your tree service. We Are Tree Removal Experts! We are tree removal experts and can remove any size tree, from large (potentially dangerous) trees to small trees. Our tree removal isn’t complete until we remove all debris from your property. Alternatively, we can leave the wood on your property if you’d like to keep it for firewood. 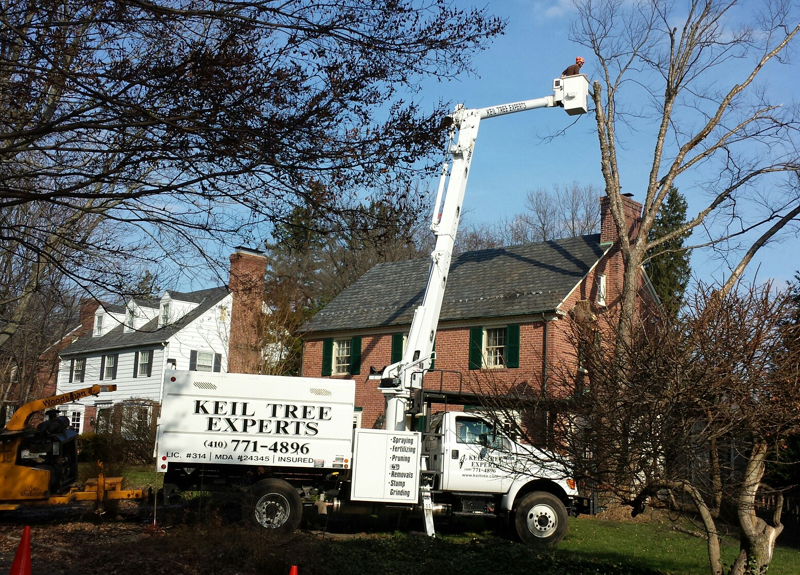 Keil Tree Experts has been in the tree service business in Baltimore County for over 35 years. 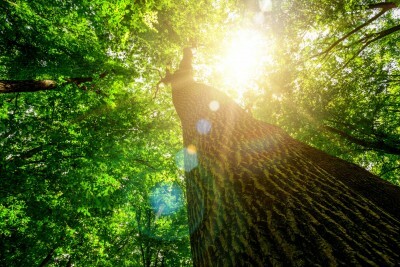 Keil Tree Experts has striven for over 35 years to be a leader in the tree care industry. Servicing both homeowners and commercial properties in Baltimore County and the surrounding areas. 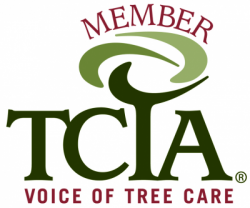 We are a member of TCIA and uphold the tree care standards they provide. Tree removals, pruning and treatments for the control of diseases and insects that are harmful to trees and shrubs is our specialty. We are able to provide service from the very largest trees to small ornamental trees. Call us at 410-771-4896, or complete our free estimate form, for an appointment to meet with one of our licensed arborists. The Better Business Bureau has determined that we meet their strict accreditation standards. The standards of BBB Accreditation mean that we will: Build Trust, Advertise Honestly, Tell the Truth, Be Transparent, Honor Promises, Be Responsive, Safeguard Privacy, and Embody Integrity. Our customers know that when they choose us they are choosing a company they can trust. Our experienced staff is capable of providing you with expert tree services. Please visit our contact page to inquire about our services and we will be happy to answer any questions you may have. We are confident that we will exceed your expectations. Young tree training helps establish early form so that the tree develops into an attractive specimen. This type of pruning includes the removal of dead, dying, diseased, interfering, objectionable and weak branches as well as selective trimming to lessen wind resistance and to increase sunlight through the canopy, leaving the exterior size and shape of the tree. Safety pruning is the removal of selective large hazardous/dangerous limbs. This specific way of pruning is tailored towards fruit production and accessibility. This type of pruning keeps hedges and shrubs looking their best, while giving them the ability to grow to their fullest capacity. Cables and rods are sometimes used to give structural support to multi-trunked trees. They give added strength to help support weak or damaged branches from high winds and storms. Below is a list of some of the common insects and diseases that we are able to help control. 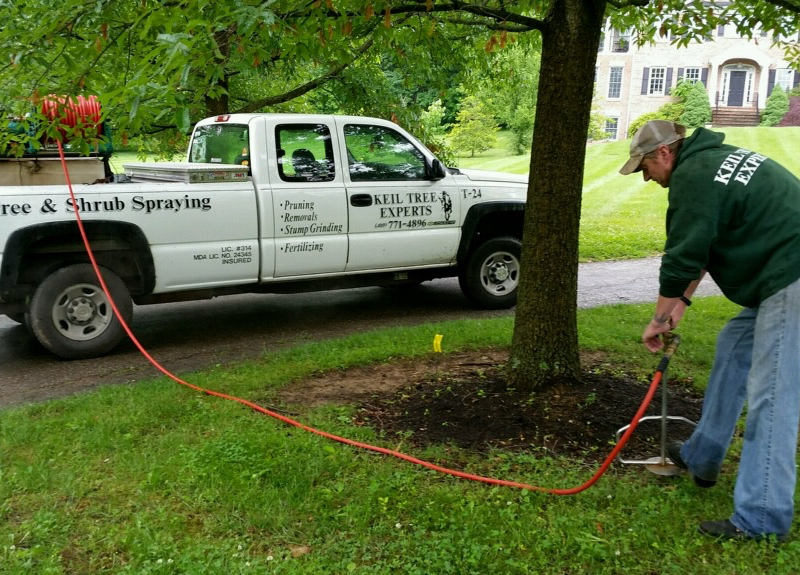 We offer treatment to control Emerald Ash Bore and other boring insects. After tree or shrub removal the stump is often a hazard or simply not wanted as a part of the landscape. We are able to grind the stump and surface roots below soil grade so that grass or flowers can be planted. 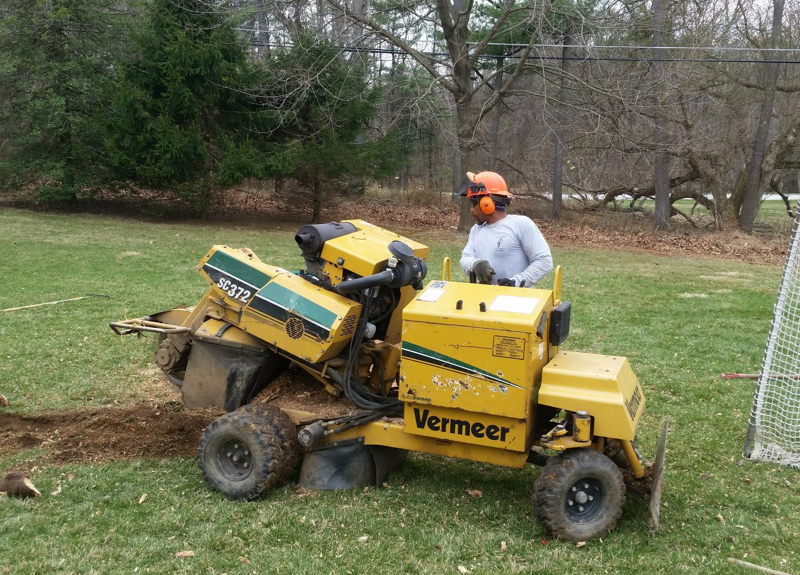 Our grinder also allows us to grind the stump up to 18 inches below grade, allowing the home owner to plant a small tree or shrub directly over the old stump. Direct root fertilizing is the injection of fertilizer into the root zone of the tree or shrub. The injections are made from the base out to the drip line. Fertilizer promotes growth and helps the plant to naturally fight off insects and disease. 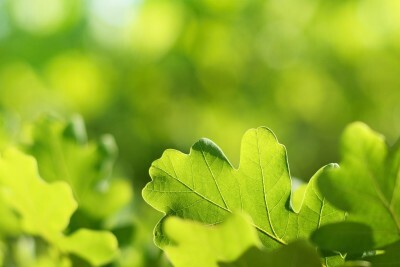 It also helps the tree to recover if already damaged by insects, disease, winter damage and mechanical damage. The two most common ways to prune or remove a tree is to climb it or use a bucket truck/aerial lift truck. Certain circumstances clearly call for one method over the other. Sometimes a combination would be the best way to do the job. An aerial lift or bucket truck provides a safe means from which to remove dangerous trees. We can not always put a climber in a rotten tree or a tree compromised after a storm. Do you need wood chips? Used for many applications, such as mulching your garden beds, refreshing a playground area, gaining some fuel for your fireplace or outdoor fire pit, or relining your walkway, we can help. If you would like FREE wood chips to be delivered to your residential or commercial area, call us at 410-771-4896 today. We know the importance of trees in our environment. They do far more than provide shade. Keil Tree Experts lives up to their name and provides excellent tree care through tree and hedge pruning, spraying for insects and disease, and cabling/bracing. Preservation of trees is our business, however, the safety of the people living around these trees are our primary goal. 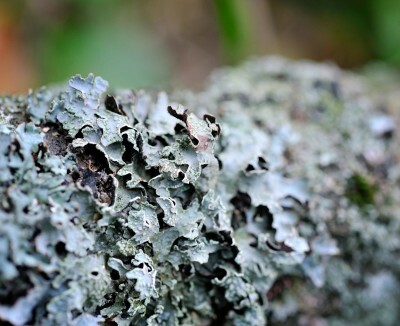 Keil Tree Experts can also provide tree and stump removal when necessary. Keil Tree Experts, Inc. has reasonable pricing for the high level of quality their work is based on. We not only get the job done, but we are sure to leave your property beautifully maintained. Keil has 35 years of experience in tree maintenance and loves to care for the environment while beautifying neighborhoods. Let Keil Tree Experts be your dependable source for tree services. 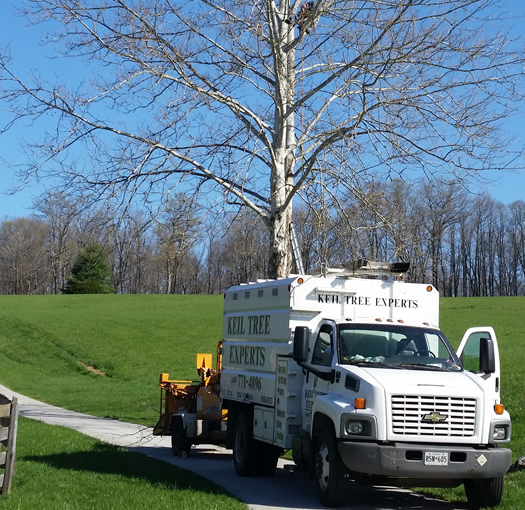 If you are in the Cockeysville, MD area and are in need of a reliable tree service that will leave your property looking very attractive, Keil Tree Experts is who you want to call. We are open and operable Monday to Friday from 7:15am to 4:00pm. Call 410-771-4896 or for assistance. For professional tree service, contact us today at 410-771-4896.